>Imperial Winter Series, race 1. And a concert. 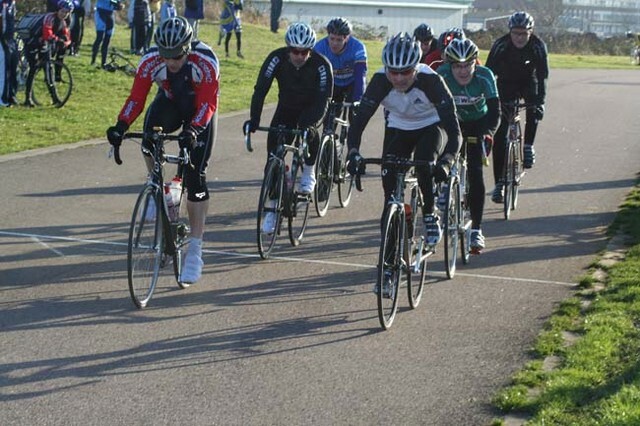 > The Hillingdon Winter Series has begun again. My aim was to stick with the 4th categories as long as possible. I was not positive about this in the days leading up to the race. Since October my training has been desultory at best. Looking back I think that I got a bit down about it all. Some people don’t train well if they’re not racing. On Friday I put away the Winter bike and did a few test laps on the Allez. The result of this test were what left me doubtful about Saturday. Race day was cold, with a headwind up the Telegraph straight. The field sizes were surprisingly big – eighty lined up for the fourths. The first mistake then was lining up at the back of the field. I was never going to see the front of the race. I surprised myself by keeping with the group and keeping my heart rate under control. The only worries were the moving time bombs (riders who twitch to one side or the other, or who hit the anchors without warning). After a while you could see where the problems lay, but I seemed to be drawn to dodgy back wheels like a magnet. There were a few crashes. I got gapped when a collision on the right led to the bunch sweeping left and almost putting me on the grass. The heart rate hit 168 (95%) as I chased to get back on. Five laps later and there was a crash right in front of me approaching the finish. The almost dead stop meant a hard acceleration and chase, but this time the gap grew. My heart rate hit 173 as I chased for a mile, but they got away. A group of six of us then got together and raced the last three laps to the finish. 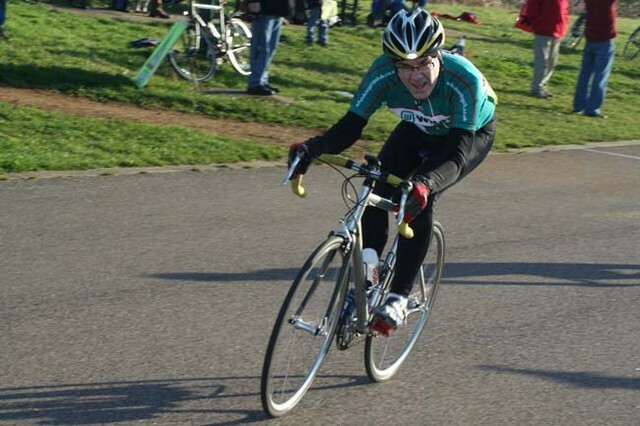 I came a fighting sixth in the group sprint for 55th out of 58 finishers. The winner was Harry Littlechild of the Dynamo. Stats: 19 miles in 48:30 – average 23.5mph – max 30.1mph – AHR 152bpm – MHR 173bpm. So, off the back again. But I felt good. Next time I need to be working higher up the bunch – in front of some of the crashes. My recovery from intense efforts is poor, so more short intervals on the turbo or on the circuit. A fine day was topped off with a concert at the QEH. P had heard Julie Fowlis singing one song on a CD and, on the strength of that, signed us up to go and see John McCusker‘s Under One Sky project. It was a great night out. I especially enjoyed John Tams, but the whole ensemble was excellent. It was not the sort of thing we would normally do, and all the better for that. Photographs from the excellent London Cyclesport galleries. Last Monday I hauled my fat arse up to Birmingham to talk about the radio play. The meeting was in a converted letter box overlooking the beautiful River Birm. I met Soweto Kinch who is going to be composing special music for the play – cool! Since then I’ve been engaged in displacement activity. And trying on different hats.